8. A tornado is always visible as a funnel cloud. A tornado is defined as “a rotating column of air that extends from the cloud base and is in contact with the surface.” The keyword in that definition is “air”, we of course cannot see air itself. A tornado does not always fill in it’s funnel with condensation or debris. We’ve seen many tornadoes that appear to the untrained eye as “skipping,” however tornadoes don’t “skip” either. What is simply happening is the condensation in the funnel at the surface is filling in if the relative-humidity and pressure drop permits. We have seen many tornadoes that were dismissed as “funnels,” despite visible evidence of rapid rotation on the ground. 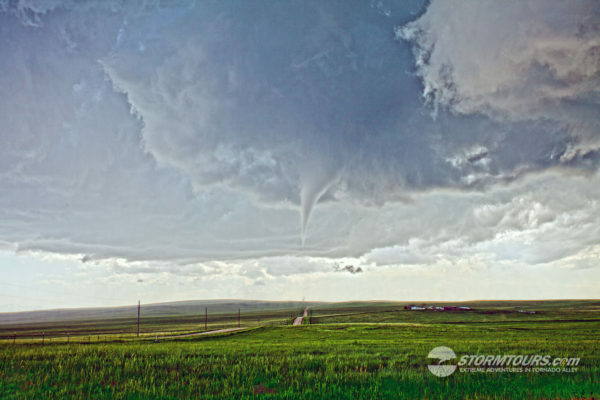 If you see a funnel don’t become fixated on the funnel itself, always look at the ground beneath it because the tornadic circulation usually extends beyond the visible funnel. More often than not, you’ll see evidence of rotation, such as swirling dirt and debris, before the condensation funnel completely fills in. Further, if a change in pressure suddenly occurs within the tornado, it may appear that the tornado is “skipping,” but careful observation will continue to show signs of ground-level rotation.